These days it seems one can’t go to the cinema without being visually assaulted by superhero films or comic book adaptations. This year alone we have witnessed the minimum result of three Marvel adaptations, several miscellaneous graphic novel variations (Cowboys and Aliens) as well as a final foray into the Transformers universe, which despite its huge box-office haul, failed spectacularly with critics. Green Lantern, based on the DC comic of same name, is an offering that promises big bangs but delivers very little. The film kicks off with our introduction to the history of the Green Lantern Corps and the emergence of a great evil called Panallax (think Galactus from the Fantastic Four world), which is hell bent on destroying life by feeding off the yellow power of fear. Following a fatal altercation with Panallax, an alien from the Corps crash lands onto Earth and entrusts his powerful ring to Hal Jordan (Ryan Reynolds), a test fighter pilot with no fear. Our titular hero is then transported off world to the home of the Green Lantern Corps, Oa, where he learns to harness the power of the ring, which turns imagination into reality through the green power of will. Running simultaneously with Hal’s awakening is the portrayal of Dr. Hector Hammond’s (Peter Sarsgaard) own exposure to the yellow power of fear through his examination of the alien corpse. Constantly disappointing his senator father (Tim Robbins) and humiliated by a rejection from Hal’s ex-girlfriend Carol Ferris (Blake Lively), Hammond seeks vengeance against those who have wronged him. From Green Lantern’s epic beginning the audience is swept into a perpetual state of confusion, with the narrative desperately trying to keep up with the continual blast of CGI. No sooner do we gain our equilibrium that we are thrust back into the fray, where the dialogue does nothing to extenuate the overstimulation we are witness to. The plot resembles a mash-up of several other (better) films and is particularly disappointing in its minimal exposure towards the exact limits of the Lantern power, as well as the multitude of outer-space environments. Director Martin Campbell is ultimately playing it safe by trying to find a balance between Hal’s developments with the Green Lantern Corps and his emotional growth back on earth. Yet this only serves to muddy the already weak story and draws away from our fascination regarding the exploration of the planet Oa. Ryan Reynolds tries valiantly to steer this sinking ship, yet it’s the supporting cast that deserves our attention. Surprisingly, Blake Lively’s character is neither a damsel nor is she overly distressed, holding her own against the quick quips of Hal, whilst maintaining leadership over a top military arms company. A noteworthy moment occurs when Carol, making Lois Lane look like an imbecile, recognizes Hal in full Lantern regalia exclaiming ‘Of course I know it’s you! Do you think I wouldn’t recognize those cheekbones, even with a mask on?’ Peter Sarsgaard also works well with what he’s given, providing a human element to the evil we only get glimpses of in the very end. His inclusion within the film seems unnecessary in comparison with occurrences away from earth. However, his intensity more than makes up for the randomness of his gelatinise face following his total emersion with yellow power. 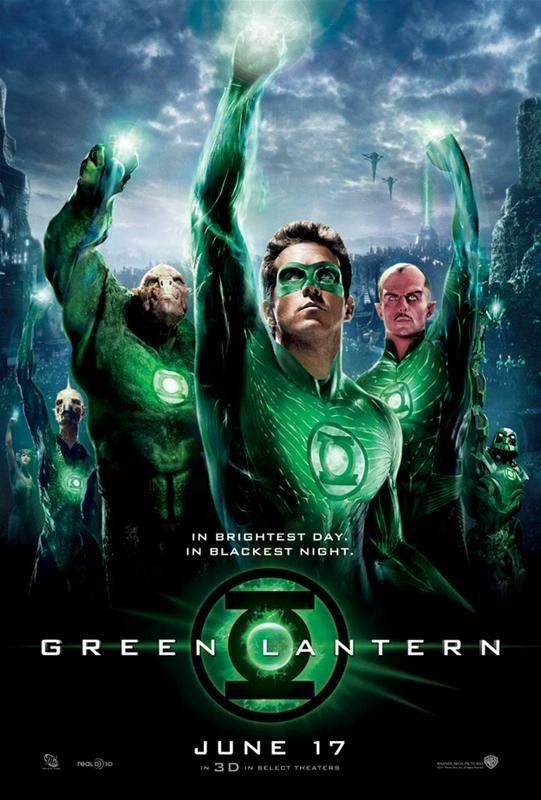 For a film that has all the right ingredients, Green Lantern does not live up to polish of previous superhero revisions. Subsequent films released in the next twelve months may be green with envy towards the breadth of Lantern’s effects, but they needn’t worry. The CGI does little to counteract the cliché ‘hero doesn’t believe in himself, then he does and saves the world’ story. It’s ironic that a film purportedly highlighting the reality of imagination and will lacks such qualities in itself.